If you’ve been doing ecommerce for a while, you probably already know that returning customers are essential for your business’s success: They are cheaper to acquire than new ones and tend to spend more. What if I told you there is one page that you probably ignore, that could boost your customer retention, sales, and revenue with some relatively simple customizations? Your Thank You Page. If I’m right, and you didn’t make any customization to this page, it means that your current Thank You Page conversion rate is at about 0%. But if you follow a few simple guidelines, you can not only use this page to produce extra income and raise your overall website conversion rate up to 10%, but you can use it to skyrocket your retention game and build strong relationships with your customers right from the get-go. It’s Easy & Simple: Re-engage your customers right before they leave your website instead of asking them to come back after they’ve already left. Customers are More Likely to Comply: According to the foot in the door psychological technique, people are more likely to agree to a request from you after agreeing to a previous one. There’s a 100% Open Rate: This is the only retention tool that gives you a 100% open rate — all customers see this page after completing a purchase. There’s no doubt that companies like Amazon, eBay, Aliexpress, and Walmart know what they are doing, and it would be smart of us to learn from their experience and copy some of the tactics that work for them. Well, these companies are already in on the secret: They optimize their Thank You Pages for customer retention, using little hooks to invite customers back to the store. What can we learn from some of the biggest online retailers about what works on the Thank You Page? By upselling on your Thank You Page, you can generate repeating sales from customers who have just purchased from you before they even leave your website. It might seem pushy, but you will be surprised at how willing a lot of customers are to buy again immediately after finishing a purchase. 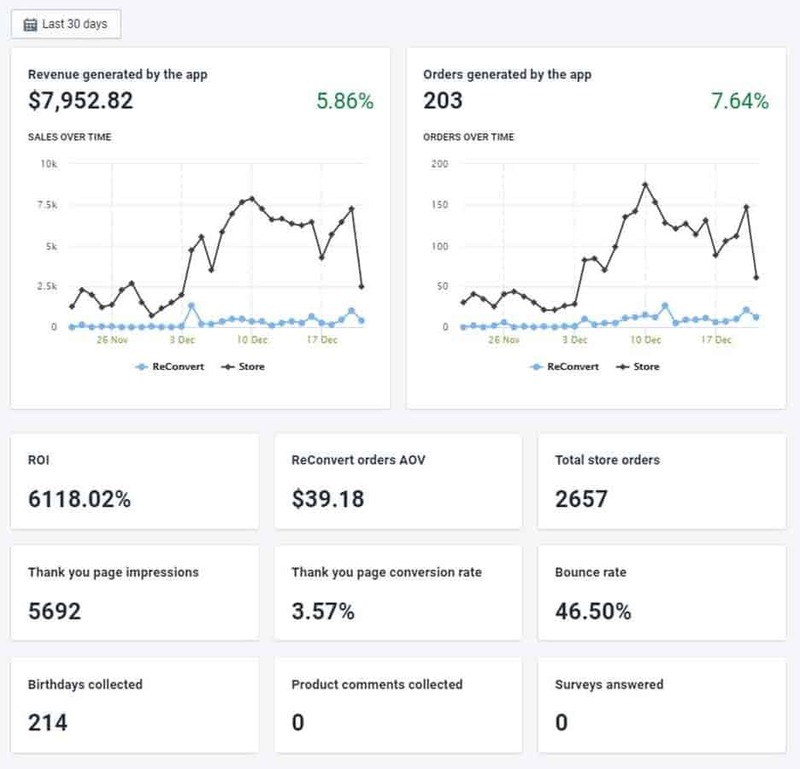 This screenshot, showing statistics from a conversion-optimized Thank You Page, is a great example of a store taking it’s Thank You Page conversion rate from 0 to 3.57% within a month, and generating an extra of almost $8,000 revenue at the same time. 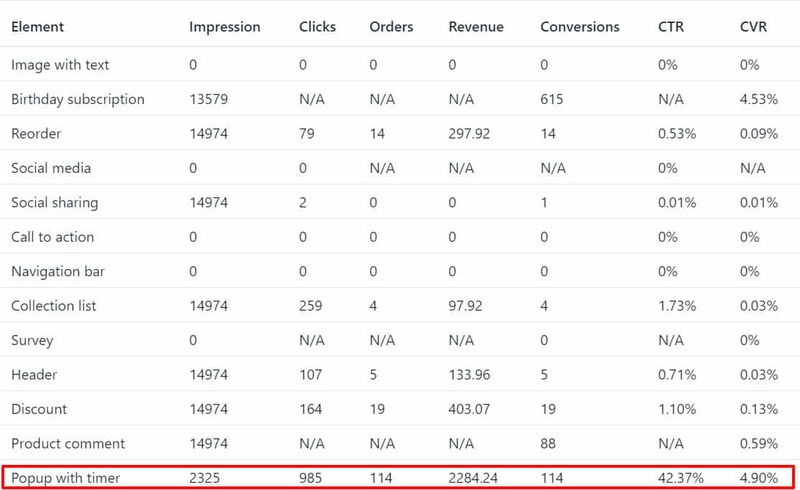 The conversion rate per order is 7.64%, which means that one out of every 13 orders generated extra revenue from the Thank You Page. Since the traffic to the store didn’t change, it means that the store-wide conversion rate was increased by 7.64%. Displaying product recommendations on the Thank You Page makes your customers feel like they are still inside your store, in an integral part of the shopping experience. Additionally, it reminds them about the items they were interested in but didn’t end up purchasing, giving them a second chance to change their mind. I see so many stores offering discounts and incentives to potential customers visiting their website while neglecting to reward or show appreciation for their existing customers. Offering a simple discount on the Thank You Page gives you the opportunity to both reward customers that have just purchased and create another opportunity to convert them with a tempting offer. One key principle to remember when it comes to post-purchase discounts is to try to make it bigger and more tempting than discounts you offer at other stages before the checkout. 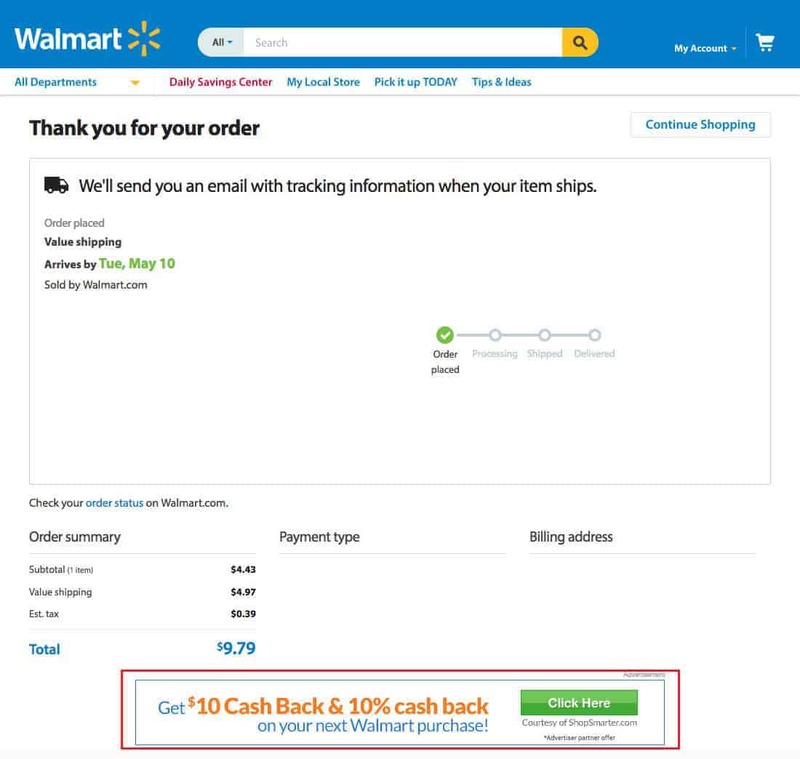 Walmart, who has recently surpassed Apple as the 3rd largest US ecommerce brand, offer a “cash back” option on their Thank You Page. In reality, they are offering their customers a $10 & 10% discount on their next order, with the goal of encouraging repeat purchases. Adding a popup to your Thank You Page allows you to make sure the post-purchase upsell you’re offering actually reaches the customer. The popup isn’t different from any other upsell you create on the Thank You Page — it can offer a discount, free shipping, display-related products or anything else that might convert the customer. The thing that really makes this popup so effective is that you don’t need your customers to opt-in to anything post-purchase. They have just purchased from you and gave you at least an email address, if not more contact information, so your post-purchase popup should not ask for anything from the customer! It only provides value by offering a discount. From our work with merchants using the ReConvert Thank You Page Builder, a popup widget is clearly emerging as the highest converting element. The fact that you don’t ask your customers to opt into anything in exchange for the discount helps to make it easier for them to say yes. Urgency is a known conversion booster. Most merchants use it in their advertising and sometimes on the product page. Urgency triggers the fear of missing out (FOMO) response in our brains and, in turn, provides us with an incentive to purchase before a specific product runs out, or a special sale expires. But, when used on the order status page, this tactic gives you the opportunity to offer your customers a discount available uniquely to customers who have just completed a purchase which is an immediate reward. So adding the urgency factor makes customers more likely to actually redeem a post-purchase offer faster since it will not be available later, rather than “thinking about it” and then never ending up using it. Most Thank You Pages have at least a general link back to the store at the bottom, but I would argue that this is not nearly enough if you are serious about customer retention. 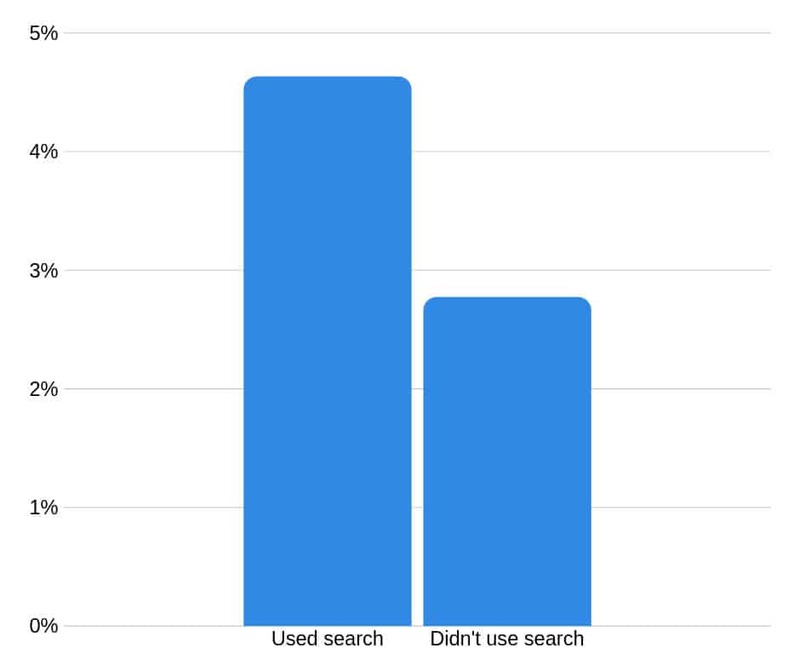 In a survey of 21 stores, it was found that visitors using search converted at 4.63%, versus the websites’ average of 2.77% which is a 1.8 higher conversion rate for search users. Customers using search usually show a higher buying intent then customers just “browsing” and adding a search bar to your Thank You Page helps you cater to these types of customers. Search exists on your Thank You Page to give shoppers who know what they want to add to their order an easy option to do it. Navigation, on the other hand, appeals to the other type of shoppers — the ones who finish a purchase and still feel their fingertips tingling with the need to buy something, or the browsers looking for the next best product to buy. A set of rightly placed links back to collections, best sellers, and special sales in your store might give these types of shoppers the direction they need to complete a second purchase. When you add navigation links and a search bar to the top of your Thank You Page, it blurs the lines between the end of one purchase and the beginning of another which encourages your customers to come back to the store. Going back to Walmart as an example, you can see above that they keep customers engaged on their website by using both a search bar and navigation links on their Thank You Page. I don’t think I need to convince any of you why your brand’s presence on social media is crucial, but did you know that customers tend to spend 20% – 40% more on companies they interacted with on social media? Getting your existing customers engaged with you on social media is a sure-fire way to keep you on their radar, as well as to grow their spending with your brand. The order confirmation page is a place where customers — who are at least somewhat interested in what you have to offer — arrive to, so why not use this interest to invite them to hang out with you outside of the confines of your website? People trust recommendations from their friends the most. In fact, they are 90% more likely to trust and purchase from a brand if it was recommended by a friend. Social media sharing is the new form of word of mouth. It is how we get our friends’ opinions and recommendations, and seeing a friend’s name positively associated with a brand makes us instinctively trust this brand more. Merchants usually add social sharing buttons just about anywhere in their store: On the product page, on the footer, on all blog posts, etc. but the Thank You Page tends to be missed out on. Using the Thank You Page to invite your customers to share their latest purchase with their friends through social media could spike your brand’s reach with very little effort on your end. Offering an incentive could always help you get better results out of your social sharing prompts. You can go even further and offer a discounted link for your customers to share which will give them a discount on their next purchase and their friends will get a discount for purchasing through their link. A great example to look at is how Amazon is doing it. They offer their social sharing widget right next to the order summary —where you can’t miss it — almost making it look like the next step in completing your order. The second thing you could do to increase social engagement is to encourage your customers to follow you on social media. These are people that have just bought from you, they are obviously interested in what you have to offer, so you don’t need to work too hard in this regard. Invite them to follow you on social media and maybe hint to some special deals that only your followers get to see. You obviously need to also put in the work to make your social media profiles engaging and interesting, so that the people getting there have a reason to stay. Once you have these customers following you on social media, you can easily reach them when you advertise for new products, sales or a new piece of content. Gymshark, while having a pretty minimal Thank You Page, is known as a brand that is heavily built on social media and influencers. So it makes sense that one of the only engagement-boosting elements on their Thank You Page is a social follow widget. Your customers’ distribution list is arguably the most important asset that a business has. Distribution lists allow you to market almost for free directly to your customers whenever you want, whatever you want. The challenge with these lists is getting your customers signed up to them. You would usually offer an incentive for signing up to a distribution list, whether it’s a discount or a ‏free resource. The really powerful thing about your Thank You Page, when it comes to distribution list sign-ups, is that you can invite your customers to sign up with an incentive they would definitely be interested in, such as getting shipping updates. They have just purchased from you, so they without a doubt want to hear from you about where their order is. So, using the Thank You Page, you can offer your customers an opportunity to choose their preferred medium to get shipping updates through. This is most likely also the medium they pay the most attention to, so it will be the most effective when marketing to them later. 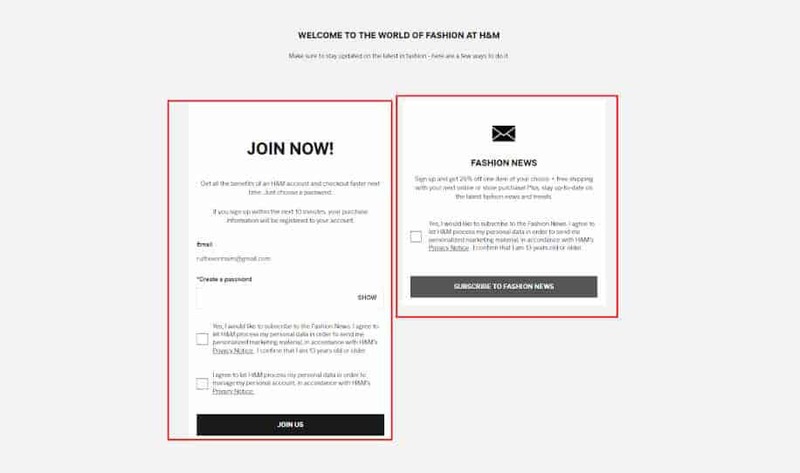 H&M collect their customers’ emails to a distribution list during the checkout process and ask for them again post-checkout if the customer didn’t opt-in the first time. Segmenting your customers is one of the best ways to ensure that your communication with them is personal and effective. In fact, it can increase open rates by 14.31% in email marketing. But in order to segment your customers, you must collect information about them. The Thank You Page is one of the best places to collect information about your customers because they’ve already made the commitment of purchasing from you, so chances are they would agree more readily to give you some more information about themselves. Collecting your customers’ birthdays allows you to send a birthday campaign leading up to and on their birthday, giving them a special birthday gift and re-engaging them with your brand. People love feeling celebrated on their birthday, so they usually happily provide this information to brands that promise to celebrate with them and make them feel extra special on that day. When asking for your customers’ birthdays, you don’t need to offer any incentive other than the future birthday promotions they will receive. We all know and understand the importance of reviews, they are one of the most effective trust boosters when it comes to on-site social proof but the challenge with reviews is collecting them. Customers don’t always remember or have the time to go back to your store and write a review post-purchase. But what if it’s a returning customer making a second purchase on your website? In this case, you can ask them to leave a review on products they’ve ordered on previous purchases. This does require a little more sophistication than all the other elements we’ve talked about so far. You need to know if the customer purchased from you before and also whether or not they’ve received their products yet. But the return-on-investment here could be huge! According to Spiegel, the higher-priced the product is, the more effect reviews have on the probability of purchase. Much like reviews, it is challenging to get customers to answer your post-purchase surveys since they’ve already completed their purchase and moved on to the next task in their lives. So, displaying a survey on the order confirmation page makes it easier for customers to say yes when you ask them to fill it in. It does not require them to stop anything that they’ve been in the middle of doing or try to remember a purchasing process that happened a few days ago. Victoria’s Secret keep their Thank You Page very branded but simple, with one of the few calls to action being an invitation to answer their survey. Customer service is known to be one of the biggest factors when it comes to customer retention and can help you improve your customers’ experiences and their satisfaction with your brand. So it makes perfect sense to start taking care of your existing customers and give them good, quality service the moment they first purchase from you. Don’t make your customers search for contact information and data they need — give it to them directly on the Thank You Page. According to Lee Resource Inc, 95% of complaining customers will do business with you again if you resolve the complaint instantly. Your best bet at fixing any problem a customer encounters immediately is by offering available support on any part of your website and that includes your Thank You Page. Make it super simple for your customers to get the information and help they need, with easily available live chat, phone, and email support right there on your Thank You Page. You can also include some relevant FAQs for people who have just purchased, including returns FAQs, shipping time FAQs, order cancellation FAQs, etc. Even if a customer cancels an order, they might still come back and order in the future if they had a good experience with your customer support. Your goal with the Thank You Page is, among other things, to provide clarity for your customers. Give them a clear flow of where they are on the package delivery sequence, and show them the process that is still ahead so that they know what to expect. 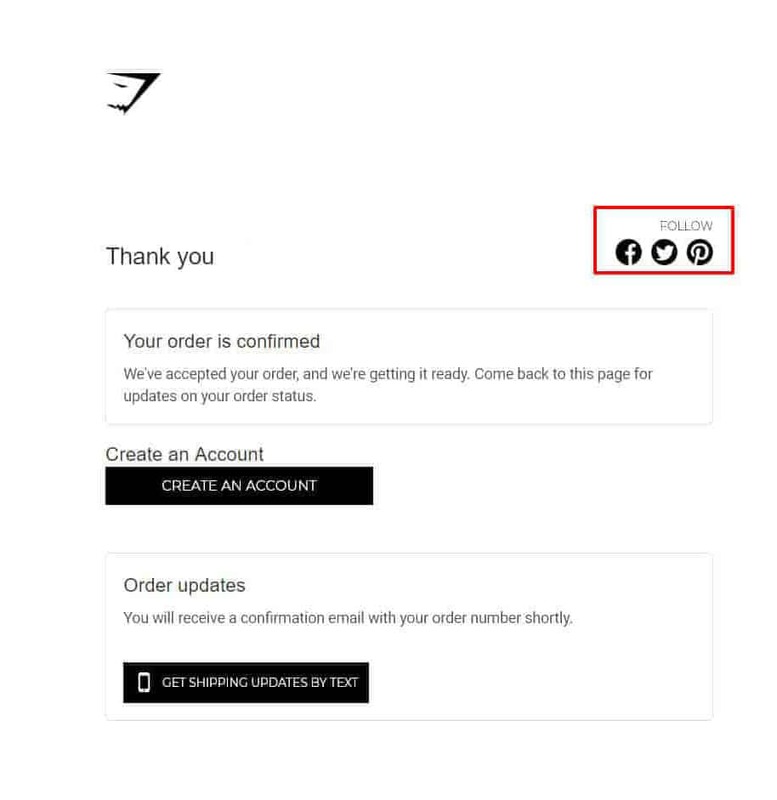 In a lot of cases, the order confirmation page turns into the order status page, the place where customers come back to track their orders. In this case, you should have specific tracking information on this page once the order has a tracking number so that customers don’t have to go to a third party site to track their package and can do it directly on your website. 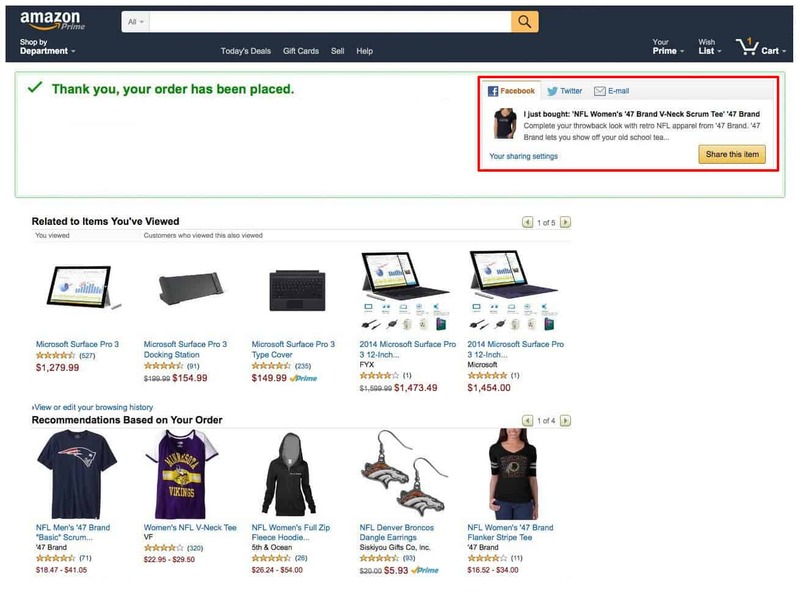 If you follow along with the recommendations in this article and optimize your order confirmation page, it will be a converting page in your store, so it makes sense that this is the page you would want to send customers to for tracking information. If you’ve read this far, you know that the Thank You Page has the potential to become an extremely powerful sales multiplier for your business, you just need to tap into its power. An important word to consider throughout this process is “Balanced.” Like everything in life and in marketing, we do not want to overwhelm our customers with pushy upsells or endless requests for information and engagement. Keep a balance between trying to get more conversions and just showing your customers that you care about their experience, while still providing value to them. A lot of the tools you use when optimizing your store for conversions are relevant when it comes to optimizing the Thank You Page, it’s up to you to know how to use them best for your brand and customers. Ruth Even Haim is the Co-Founder and the Head of Content Marketing at StilyoApps — Shopify apps built by merchants for merchants. 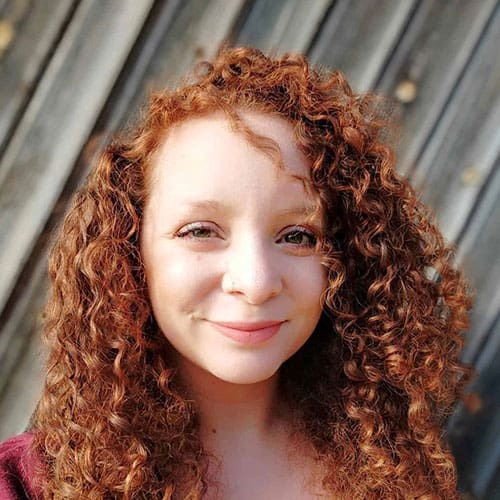 Ruth ran multiple Shopify stores in the last 4 years, and is passionate about helping other merchants and entrepreneurs succeed on their journey.